DescriptifChicco Caddy backpack baby carrier model. Rented with canopy and rain cover. Suitable for children aged 6 months+ till 3-year old. (15 kgs max). unfolded: 48 x 78 x 46 cm. folded: 41 x 87 x 18,5 cm. 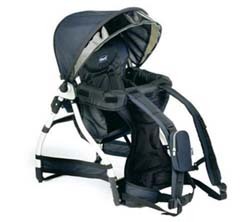 As having a backpack baby carrier can be a bit cumbersome if you don't use it often or to carry while traveling by plane, this baby carrier rental can be a good opportunity to get a coz product for your walks in France countryside. And this model is comfortable for both baby and carrier. With its foot, it is also easy to put baby down during the walk. Need to rent a baby carrier in Paris for more than 1 month? Contact us for a specific quote.